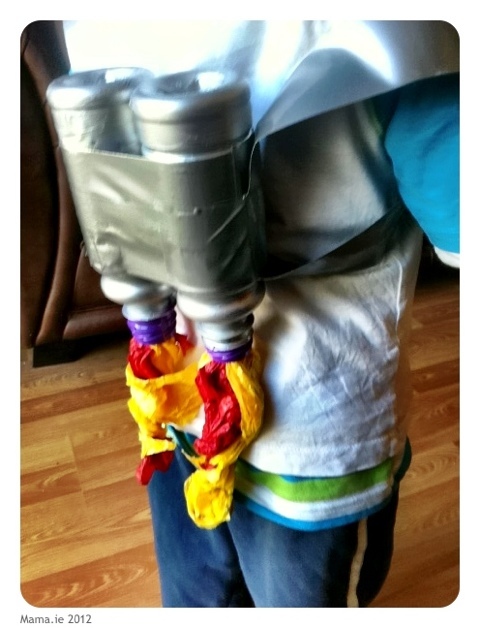 Home » Play » Craft: Rocket Pack! Seems this arts and crafts buzz is catching, because Charlie has been getting in on the act too and doing a pretty good job of it! The recycling bin in our house has become an infinite source of crafting materials. This time it was the turn of some plastic Fruit Shoot bottles to be reborn as something wonderful – a rocket pack! Making the rocket pack couldn’t be easier. Paint the juice bottles silver and leave them to dry. Then tape them together using duct tape. To create each strap for the backpack lay two long pieces of duct tape one on top of the other, with the sticky sides together. This gives you a nice smooth surface on each side of the strap. Create a loop with the strap and tape it in place on the backpack. Repeat for the other side. Then scrunch up some yellow and red tissue paper and stick them in the open bottle ends to make the flames. And that’s all there is to it. We did make one minor adjustment after a test run. We wrapped some duct tape around each strap to create a 3-4 inch loop at the end of the strap. This was to give Little Man something to hold on to while the rocket pack propelled him around the room! Brilliant, must try that at home! This is brilliant, hours of fun! So creative.